A bronze incense burner in the form of an archaic ding vessel, the rounded bowl-shaped body supported on three straight legs. The flat, lipped rim is applied with two U-shaped handles. The exterior is inlaid in fine silver wire with a design of archaistic taotie masks and a wide key-fret pattern to the rim. A single pointed leaf design is applied to each leg. The vessel has an even bronze patina. The underside of the body is inlaid with a two-character signature, reading Shi Sou. With a hardwood cover and stand: the cover is carved in openwork and has an agate finial, whilst the stand is of triangular shape and incised with a Taiji pattern in the middle. With a Japanese wood box. The form of this incense burner clearly imitates bronze vesssels of the late Shang (16th century – c. 1046 BC) and early Western Zhou (c. 1046 – 771BC) dynasties. These vessels, known as ding, were used for cooking and ritual offerings originally. 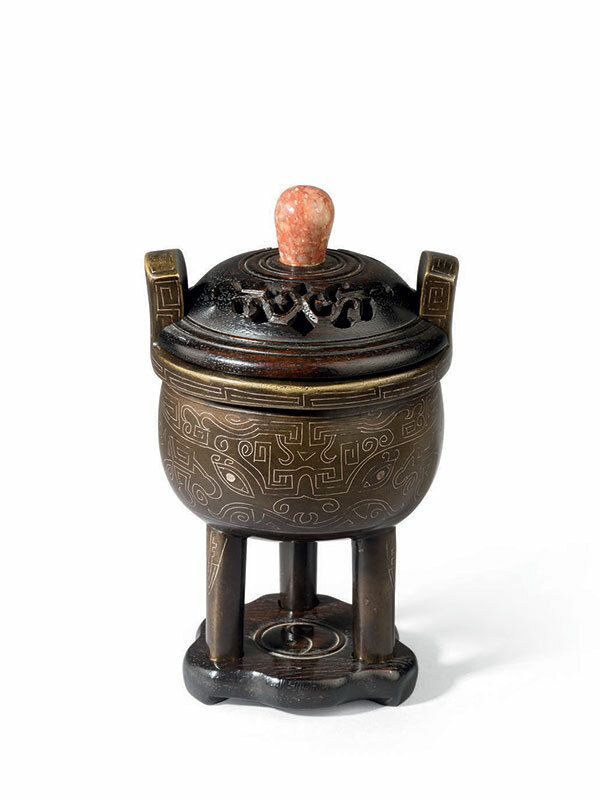 According to Ge Gu Yao Lun (‘Essential Criteria of Antiquities’), which was compiled by Cao Zhao in 1388, archaic bronze vessels were never used as incense burners. The compactness and portability of ancient bronze tripods of this type enabled them to be used as censers in later periods, particularly in a domestic setting or in the scholars’ studio. 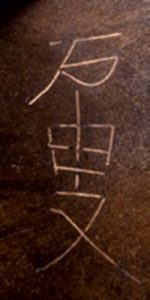 The signature Shi Sou might refer to an individual artist or is possibly the name of a very large workshop. In the present vessel, the delicate inlay of the silver is of fine quality and contrasts well with the patina of the bronze. A very similar bronze censer of ding form and with the Shi Sou mark on the base, slightly larger in size and with comparable taotie decoration in silver inlay, is dated to the 17th to 18th century and is in the collection of the British Museum. A 17th century bronze tripod vessel from the Carl Cords collection, inlaid with silver and gold, of similar proportions and design, is now in the Arts and Crafts Museum in Frankfurt. Another 17th century bronze tripod censer inlaid and overlaid with gold and silver, of comparable form and with a hardwood cover with agate finial, is in the Robert E. Kresko collection at the Saint Louis Art Museum.